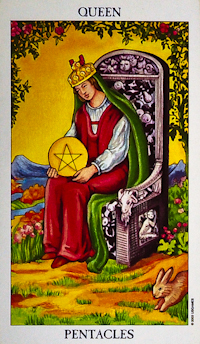 Queen Of Pentacles. Tarot. Free Tarot. Free Tarot Reading. The Queen is dressed in an elegant but conservative costume, which befits her character. Her throne is decorated with symbols of fruitfulness. The goat, symbol of Capricorn, is carved into the arms of the throne. Flowers are in bloom all around her. The hair is also a symbol of fertility and productiveness. Cherubs always indicate the protection of divine beings, who radiate love, peace, happiness and contentment.